A small electric space heater can save you money on energy bills. If you use a portable heater to warm up the area around you, you may be able to keep the temperature lower on your central heating system, leaving the rest of the house cooler. However, it’s essential to buy space heaters wisely and use them carefully. If misused, space heaters can be dangerous and expensive to operate. Do not use electric space heaters to warm up every room, but you can efficiently heat a small area – such as around the desk in a home office, for example. Safety and efficiency are the keys to using electric space heaters. Buy a new model with the Underwriter's Laboratory safety seal and a safety guard around the heating element. Also, look for a space heater with an automatic trip switch that will turn off the heater when it falls over. Plug portable electric heaters directly into the wall socket. If you must use with an extension cord, choose a heavy-duty cord in the shortest length possible. Put space heaters on a level surface in an area where children, pets, and others can't walk into them and burn themselves. Don't use portable space heaters in a bathroom or near water. Instead, hire an electrician to install a wall-mounted electric heater that is labeled for bathroom or outdoor use. Never leave the heater on when you are sleeping or away from the house. 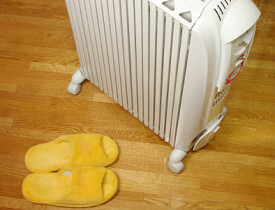 A big reason to use an electric space heater is to save energy and lower utility bills. Make sure to maximize your energy savings by choosing the right space heater and using it efficiently. Most important, use electric space heaters sparingly to provide extra heat in one room. It is too expensive to use electric space heaters to heat the whole house. Though electric power may be cheaper per unit than natural gas or oil, the cost of electric heating is higher. For cost savings, turn down the furnace to 55 degrees F and put a space heater in a child's room or near a regularly used spot, such as your office desk or an armchair where you like to read. Smaller spaces are easy and inexpensive to heat with a radiant space heater, which heats nearby people and objects, not the air itself. The alternative option is a convection heater, which relies on a fan to spread the heat via air circulation around the room. To maximize efficiency, check wattage and size rating listed on the space heater (similar-seeming models can vary in terms of wattage) and choose the right heater for the size of your room. Also, look for a space heater with an automatic temperature control so you don't overheat the room or constantly switch the unit on and off. A timer is useful, as well. You can take advantage of electricity savings with an electric space heater. Just buy and use it carefully to maximize safety and savings. For more suggestions on energy-efficient heating, consult an experienced HVAC professional. This article was updated November 8, 2017.